In Norroway, long time ago, there lived a certain lady, and she had three daughters: The oldest of them said to her mother: “Mother, bake me a bannock, and roast me a collop, for I’m going away to seek my fortune.” Her mother did so; and the daughter went away to an old witch washerwife and told her purpose. The old wife bade her stay that day, and look out of her back-door, and see what she could see. She saw nought the first day. The second day she did the same, and saw nought. On the third day she looked again, and saw a coach-and-six coming along the road. She ran in and told the old wife what she saw. “Well,” quoth the old woman, “yon’s for you.” So they took her into the coach and galloped off. The second daughter next says to her mother: “Mother, bake me a bannock, and roast me a collop, for I’m going away to seek my fortune.” Her mother did so; and away she went to the old wife, as her sister had done. On the third day she looked out of the back-door, and saw a coach-and-four coming along the road. “Well,” quoth the old woman, “yon’s for you.” So they took her in, and off they set. The third daughter says to her mother: “Mother, bake me a bannock, and roast me a collop, for I’m going away to seek my fortune.” Her mother did so; and away she went to the old witch. She bade her look out of her back-door, and see what she could see She did so; and when she came back, said she saw nought. The second day she did the same, and saw nought. The third day she looked again, and on coming back said to the old wife she saw nought but a great Black Bull coming crooning along the road. “Well,” quoth the old witch, “yon’s for you.” On hearing this she was next to distracted with grief and terror; but she was lifted up and set on his back, and away they went. Aye they travelled, and on they travelled, till the lady grew faint with hunger. “Eat out of my right ear,” says the Black Bull, “and drink out of my left ear, and set by your leaving.” So she did as he said, and was wonderfully refreshed. And long they rode, and hard they rode, till they came in sight of a very big and bonny castle. “Yonder we must be this night,” quoth the Bull; “for my elder brother lives yonder;” and presently they were at the place. They lifted her off his back, and took her in, and sent him away to a park for the night. In the morning, when they brought the Bull home, they took the lady into a fine shining parlour, and gave her a beautiful apple, telling her not to break it till she was in the greatest strait ever mortal was in the world, and that would bring her out of it. Again she was lifted on the Bull’s back, and after she had ridden far, and farther than I can tell, they came in sight of a far bonnier castle, and far farther away than the last. 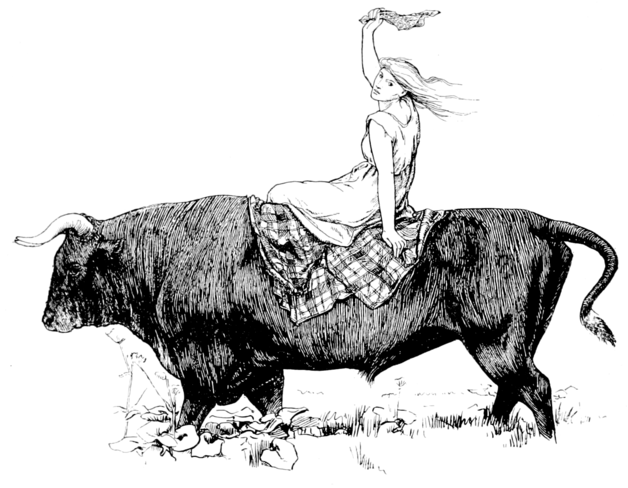 “Again she was lifted to the Black Bull’s back.” Illustration by John D. Batten. Published in More English Fairy Tales(1922). 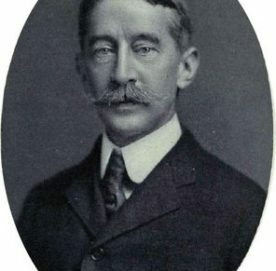 G. Putnam’s Sons. Says the Bull to her: “Yonder we must be this night, for my second brother lives yonder;” and they were at the place directly. They lifted her down and took her in, and sent the Bull to the field for the night. In the morning they took the lady into a fine and rich room, and gave her the finest pear she had ever seen, bidding her not to break it till she was in the greatest strait ever mortal could be in, and that would get her out of it. Again she was lifted and set on his back, and away they went. And long they rode, and hard they rode, till they came in sight of the far biggest castle and far farthest off, they had yet seen. “We must be yonder to-night,” says the Bull, “for my young brother lives yonder;” and they were there directly. They lifted her down, took her in, and sent the Bull to the field for the night. In the morning they took her into a room, the finest of all, and gave her a plum, telling her not to break it till she was in the greatest strait mortal could be in, and that would get her out of it. Presently they brought home the Bull, set the lady on his back, and away they went. And aye they rode, and on they rode, till they came to a dark and ugsome glen, where they stopped, and the lady lighted down. Says the Bull to her: “Here you must stay till I go and fight the Old One. You must seat yourself on that stone, and move neither hand nor foot till I come back, else I’ll never find you again. And if everything round about you turns blue, I have beaten the Old One; but should all things turn red, he’ll have conquered me.” She set herself down on the stone, and by-and-by all round her turned blue. Overcome with joy, she lifted one of her feet, and crossed it over the other, so glad was she that her companion was victorious. The Bull returned and sought for her, but never could find her. Long she sat, and aye she wept, till she wearied. At last she rose and went away, she didn’t know where. On she wandered, till she came to a great hill of glass, that she tried all she could to climb, but wasn’t able. Round the bottom of the hill she went, sobbing and seeking a passage over, till at last she came to a smith’s house; and the smith promised, if she would serve him seven years, he would make her iron shoon, wherewith she could climb over the glassy hill. At seven years’ end she got her iron shoon, clomb the glassy hill, and chanced to come to the old washerwife’s habitation. There she was told of a gallant young knight that had given in some clothes all over blood to wash, and whoever washed them was to be his wife. The old wife had washed till she was tired, and then she set her daughter at it, and both washed, and they washed, and they washed, in hopes of getting the young knight; but for all they could do they couldn’t bring out a stain.